Is this woman a Freemason? It depends who you ask. Every autonomous Masonic body has its own tests of regularity, based on its perception of its own character. Thus, each Grand Lodge considers itself to be regular, and requires its constituents to abide by its criteria, whether clearly defined or not. Consequently, every Mason considers himself to be regular because he (or even she!) was ‘regularly’ initiated in a ‘regularly’ constituted lodge, chartered by his (or, indeed, her) Grand Lodge." Within the closed system of the autonomous Grand Lodge, determination of regularity—or its converse, irregularity—is a relatively easy process, and entirely valid. Problems arise when the definition of ‘regularity’ of one autonomous body is applied to another autonomous body, because ‘regularity’ is a factor in determining whether Grand Lodge A should ‘recognise’ Grand Lodge B, and vice versa. So why do I bring up such a confusing subject? To educate, of course! More to the point, I bring this all up to mention that our Library & Archives collects broadly about the world of Freemasonry. Because we are interested in giving researchers the ability to look at the history of Freemasonry and fraternalism in its entirety, our Library & Archives collects broadly in both Freemasonry and other fraternal groups (focusing especially on Freemasonry and fraternalism in the United States), so our collections contain publications by and about any number of different Masonic organizations. Some of these organizations admit just men, some both men and women, and some just women. While we'll refer you to a particular Masonic body if you've got specific questions about whether one Masonic body recognizes another or considers them regular, we'd be happy to assist you with learning and conducting research on any aspect of Freemasonry - whether you consider it regular or irregular. The photo above shows Worshipful Brother Mary Arlotte, Grand Sword Bearer. It's from the May 1933 edition of The Ray, a magazine published by The Honourable Fraternity of Ancient Freemasons. (And, yes, members of this self-described "masonic fraternity of women in the U.K." do refer to each other as Brother, something that they address on their FAQ page.) This organization is not recognized by a lot of the "mainstream" Masonic bodies, and I include it as an example of something that might be surprising and eye-opening to folks who know little about the rather large world of Freemasonry in general. 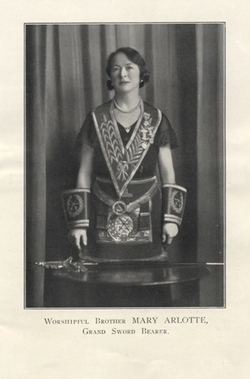 If you're curious about women and Freemasonry and you're in London, you might want to check out an exhibition called Women and Freemasonry: The Centenary, that's currently on view at the The Library and Museum of Freemasonry. The Ray. London: The Honourable Fraternity of Ancient Freemasons, 1933. No. 24 (May 1933).